Our seasonal Ledbury 8 women's cami and short pajama set is adorned with our Indian themed repeat graphic which showcases elephants, tigers and horses hidden amongst the coconut trees. If you look carefully, you may even spot the Rose family cat hidden amongst the flora and fauna! Featuring a flattering A-line body, adjustable spaghetti straps, side vents and a deep V neckline with bust darts for a tailored shape, our cami short pajama sets come in luxuriously soft cottons and silks, designed to keep you cool, comfortable and stylish during warmer nights. 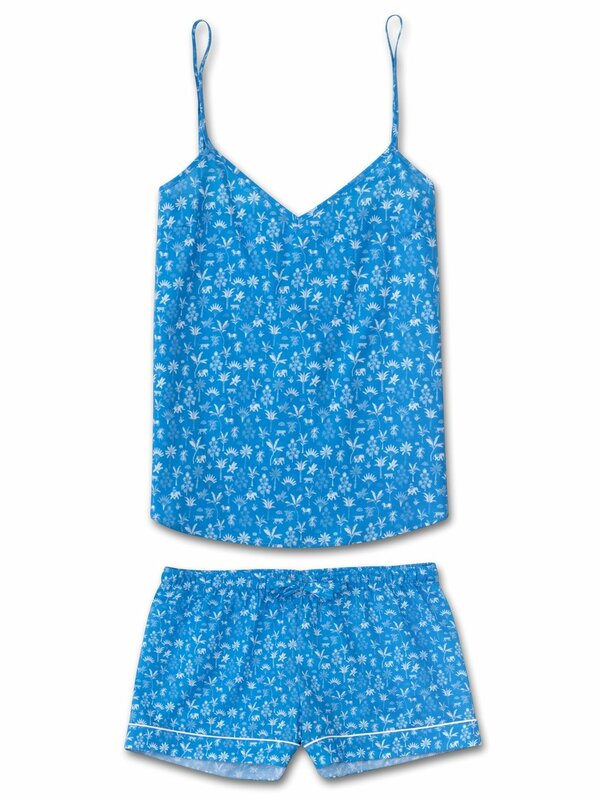 Made from our signature cotton batiste - a lightweight and luxuriously soft fabric - the Ledbury 8 blue camisole PJ set also features shorts with an elasticated waist and self fabric drawstrings for added comfort. The shorts are finished with complementary white piping for an added touch of luxe. A firm favorite of our customers for its breathability, lightweight properties and luxuriously soft feel, our cotton batiste fabric has become a signature of Derek Rose quality. A dream to lounge or sleep in, our short PJ sets are also perfect for travellers and holidaymakers, as they're not only comfortable in warm climates, but also light to pack and easy to carry.